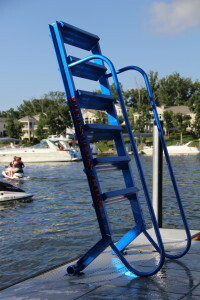 Powder Coating Options: All Wet Step products can now be ordered in many great colors to match your dock accessories, boat or even your favorite team. 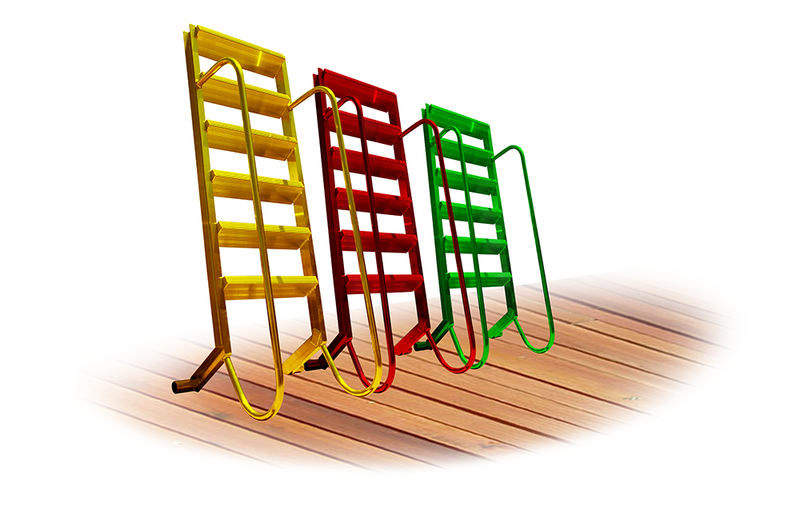 Powder coating will protect your ladder from discoloring as aluminum will oxidize in water. On a welded together – steps are 24” wide & 6” deep. On a bolt together – 20” wide & 6 “ deep. Just like a pontoon boat, when aluminum is left in the water, it will discolor. You will see a water line unless you use choose a powder coating option. We offer the coating for an additional charge or pick a color and let us powdercoat it for you! Yes. Simply rotate it out of the water when not in use. Every Wetstep comes with a lock in to hold in place in case of heavy winds. No. It is recommended to remove it from the water when not in use to prevent algae, barnacles, etc. from growing. These types of build-up can make any step slippery, so take it out of the water to keep it clean as aluminum will discolor in water. All metal oxidize; however, unlike other metals, aluminum performs extremely well in water. Please note: Aluminum will never rust although it will discolor in water. Made in the USA – Lake of the Ozarks, Missouri. Shipping rates will vary from state to state. All Wet Steps dock products have a 10 year warranty on the construction however there is no warranty on powder coating. Will this work for pets? Large dogs too, check out the video. Click here to locate a dealer near you. Most of them can help you with delivery and installation or shipping.